My fellow bloggers, website owners and editors. I understand we all need to make a living and money is the key driver to more freedom to do what you want. But can we please drop In-Text Advertising as a way to make our living? 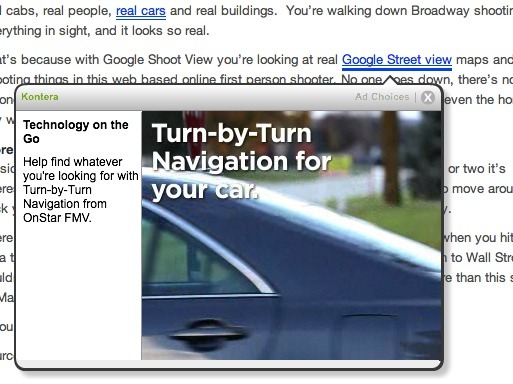 It’s a bad user experience, click throughs are very low on these annoying pop-ups, and you make peanuts on the clicks. From one side, as a user I can easily understand these double lined links are different than the normal links on the website. However, the double lines on these make my mouse hover over the links almost automatically. You know, I’m really easily distracted from anything, where a different patterns in the normally designed CSS of a website will draw my attention. A mouse over will open up the pop-up for the advertisement, which slows down my ability to read the full article. Great, now you have me focussed on something completely different than the article I was reading. I will have to move my pointer to the little cross in the upper right corner, click your pop-up away, and try to find where I was in the article to continue reading. As a metter of fact, I probably will have to re-read the paragraph your ad was in, which annoys me. Most of the time, I will just leave the website, and forget what I was reading. And most of the time, the ads are not even that relevant to the article I’m interested in. The fact you are able to research keywords and target these in an editorial context does not necessary make the advertisement relevant to what I’m doing at that exact moment. I can see that in a search environment, where I’m specifically type in a search query to look for information around those keywords. If an advertiser is prepared to pay for traffic around the keywords I’m typing in in my search for information, that’s great. However, when I’m reading an article, I have a completely different objective: interest in the full article! Really…? 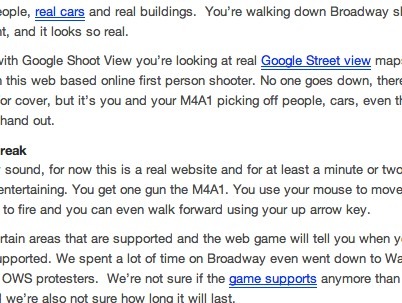 Case in point, in the above screenshot of the Kontera In-Text advertisement pop-up I was reading the following article: Dutch Company Turns Google Street View Into A First Person Shooter. As the title speaks for itself, I’m not going to explain what the story actually was about. If you would like to read it, I suggest to click on the embedded link. But what I would like to point out here is the question I raise how the advertisement for a Lexus car, Car Navigation equipment or the ad for a Samsung Smart Phone are relevant to the story of a Dutch advertising agency called Pool Worldwide has turned Google Maps into a first-person shooter. Seriously, as a marketeer I even question if I would allow my brand to be promoted next to a controversial projects like the one described in the article here. Next time a shooting happens which might be inspired by violent first person shooter games, there might be a backlash for the advertisers promoted next to any of these articles. Next to the annoying pop-ups which make up for a bad user experience, and the unrelated advertisement, there is a third dis-advantage for any website serving these In-Text advertisements; an external server call to match keywords in text with the keywords advertisers are buying. This external call will slow down the site, which will impact the user experience for both humans as also for robots. I have not done any testing of the impact of the total page download time. But this would be something to consider. Ultimately, every webmaster, website owner or editor should decide by themselves how they would like to monetize their content, how they make a living and how to please their readers. For me, it would be better if the in-text advertisers would disappear altogether as I would finally be able to finish some of the articles I would like to read, instead of getting distracted all the time by a non-relevant pop-up!